Yeah, I get a really palpable katamari vibe from that gif. It's great. I caught the plague that's been going around at work, so things were a little slow today. I managed to get stack compression and jumping in, though. The Rat Stack is hilariously close to the concept I had in mind for Standing On The Shoulder Of Babies. Really interested in seeing where you take this. Think you'll ever get a chance to make that? I'd love to see someone else's take on this kind of mechanic. Stackrats! They are like packrats but more active and cute apparently! Are the rats so adorably stackable because they are from Sweden? Ha, are Swedes known for their stacking prowess? I think I'm missing something here. After having lurked around thumbs for the last seven or eight years, I have just now created an account to simply say ....I love you little rat king guy! I cannot wait to play this. I love everything about this. This looks really, really good! I love the animations of the smaller rats. And those Rat King arms flopping around. Oh man! Alright, it came out even smaller than I though it would but it's up. There are two stages out of the five or six I wanted to get in that are both really short, but they work on a basic level. It's like a prototype of a proof-of-concept of what I wanted to do, but there's probably a little fun to be had. I certainly had enough fun working on it to make this worthwhile, anyway! And thanks so much everyone for your comments, support and input! Wow, awesome! Rat King loves you too, he told me so. Dude, you gotta keep working on this! I need MORE LEVELS! MORE RATS! To be perfectly sincere, I would pay somewhere in the vicinity of 5-8 of my hard earned euros if you released a 30 level version of this. It plays and looks great. Please don't leave it at a prototype. Seconded (but I will pay in American Dollars). God, I loved the art and control of this so much. Lot of fun! Just the levels you have here are super entertaining. There is a lot of potential here for more complex puzzles. Game is awesome. Really simple 2 levels, but everything is so concisely designed. I really enjoyed it. A full game would def be great. 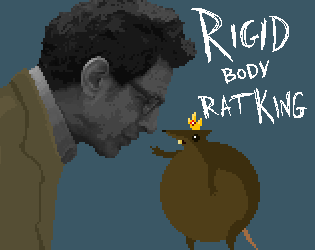 And you can't go wrong with a title like Rigid Body Rat King. Why Golblum hate rats so much? Is that canon? This looks amazing and the controls are a lot of fun. I would definitely like to see you continue working on it, because there's a lot of promise in the mechanics! The animations are wonderful, too. Thanks a ton, really glad you all liked it! I'll try! I've got a few other projects that take precedence for now, but I'd definitely like to keep stacking rats in the future. I'm not sure Goldblum hates rats so much as he's indifferent and perhaps unaware of them. Even kings are beneath his notice when he's lost in thought, pondering chaos theory and Fly stuff. This is honestly an amazing proof of concept for your mechanic. Getting to the part where you need your stack to be tall enough to chew the rope is brilliant and really made me want to see what other directions you could build the puzzles in. Perhaps the best episode title ever. This was such a good use of the concept. I love the way the little rat arms flail. I managed to finish both stages, and had fun doing it! Bonus points for Mild Jeff Goldblum Content. The Rat King himself only has one actual animation for his head, to give him a look of surprise or alarm when he hits something. Then the little rats have Idle, Squeak, Groom, Run and Fall. And Goldbloom has his walk cycle, which I made with the free version of Spriter. I had to re-export that a few times with the timeline stretched out first to 30, then 60 frames until it was finally smooth enough to not look like a slideshow compared to everything else in the game. That probably took the longest. 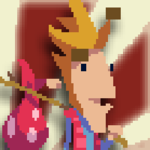 Great exploration of mechanics with sweet pixel art to boot. Woah, this has the beginnings of a genuinely good game! Your art and animation is so great. I loved the walking person and there was a really nice feel to the movement. This would totally work as a full release. The art is beautiful and the gameplay mechanics are interesting. Thanks guys! Next time I need a break from my main project I'll probably come back to this and flesh things out a little more.